It Follows is the latest in a long line of teen horror stories set in suburbia. If you've seen any of a dozen of cinema's horror classics, the chances are you've seen elements, even direct shots, from It Follows. It makes references to everything from Cat People to Halloween. Despite this, through sheer force of filmmaking, It Follows joins recent horror standouts like The Babadook and The Conjuring on the shortlist for new horror classics. The setup of the film is surprisingly familiar, though it subverts tropes in subtle ways. The teens here are high school graduates, and several are actually in their early 20s. They wander aimlessly in post-industrial Detroit, ostensibly working dead-end jobs, taking a few prerequisites at the local college, and partying at the 'rents house. While on a date with hunky jock Hugh (Jake Weary), Jay (Maika Monroe) begins to notice his strange behavior at a classic movie house. She gets more than she bargained for when Hugh knocks her out and ties her up later that evening. Hugh tells Jay, that he has passed on the vengeful spirit that has been staking him onto her. The rules (ever important for this type of film) are that the It will follow the target until he or she passes it onto a date and, while It will follow relentlessly, it can only walk. A cold open informs the audience that It has lethal intentions if It catches It's prey. Hugh keeps Jay captive just long enough for her to glimpse the poltergeist, and escape. His parting advice is to keep running and pass the ghost on to some other guy. It is an easy metaphor for any one of various STIs, and the film contains a variety of Freudian and Jungian motifs. Thought It can apparently swap genders (and appearances), the creature also recalls the incubus and succubus myths, male and female demons who attack humans of the opposite gender by sleeping with them. It Follows effective, not only because it taps into these primal fears surrounding the dating scene, because also because it raises more questions than it answers about the central villain. Where did It come from? Why does it only walk? Does Hugh know all of the rules, or are there more? How many Its are there? There are no shamans or eccentric paranormal scholars to explain Its origins. It Follow's score is so incredibly effective. The score instantly recalls those of John Carpenter, particularly his theme to Halloween. Some of the films most effective moments would be very cheesy without the score and effective camera work. After all, nothing is inherently scary about people walking, but the filmmakers keep walking figures in the background of many scenes keeping the characters - and the audience - on their toes. 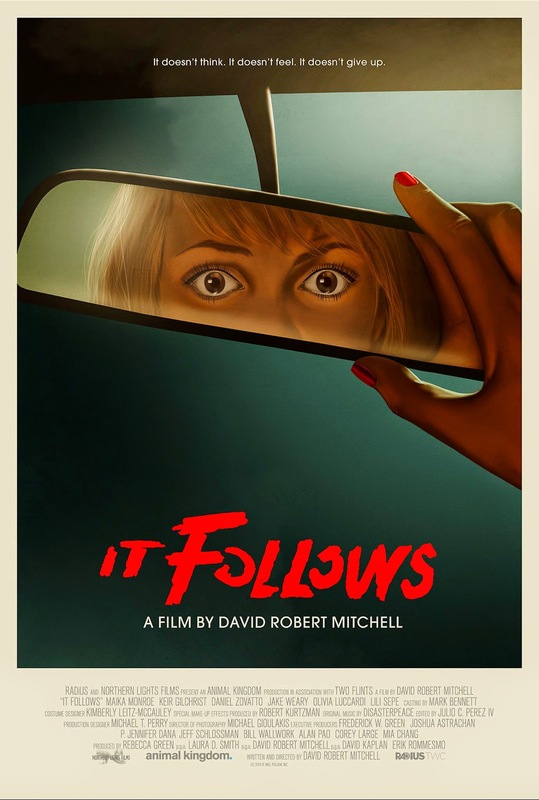 It Follows was directed by David Robert Mitchell, a Metro-Detroit native who shoots in several recognizable landmarks, including the Redford Theater. It Follows is Mitchell's second feature length film. This film gets a strong recommendation. The only thing scarier than watching this film in theaters would be catching it at 11:11 pm on cable.